Now Taking Deposits on Blacks, Chocolates, and Yellows! We have Future Chocolates coming! Call Carl in CA today for information! Amazing Proven Litter from Rugby and Ginger! You can read all about Rugby on our STUD page, he is an all around GREAT companion, hunting , hiking, around the house, kids, other dogs, he's wonderful. Ginger has and excellent pedigree, loves to please, retrieve, and swim. She is a sweet working companion. These are Classic Field style Yellow puppies. Josie and Jake are both out of EXCELLENT Field lines with tons of desire to please, ability to take pressure, and willingness to please. And will make a great all around companion. Price is 1100.00 for Males, 1200 Females. 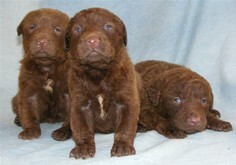 We have a few Chocolate puppies! Call Carl today! Price is 1100.00 a puppy. Just love brown dogs? Check out our Chesapeake Page! Click Here!